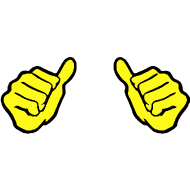 What has two thumbs and is entered in this year’s Great North Run? 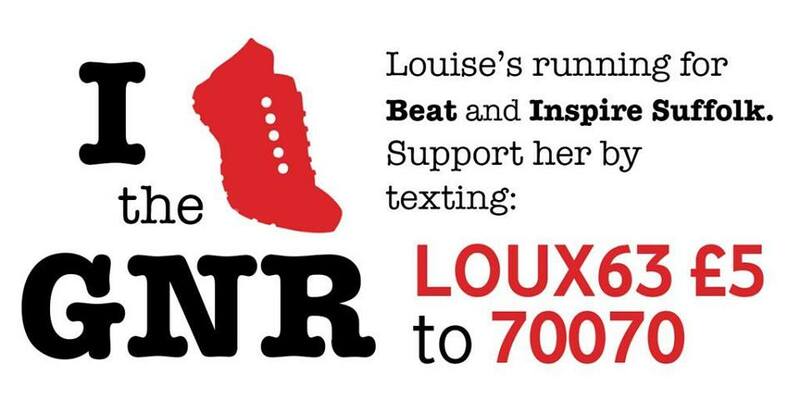 I figured that you can’t run such an amazing race without fundraising a little bit for charity so I’ve been asking friends, family and COMPLETE STRANGERS to help me reach my target of £300. Don’t worry rather than going around with a paper sponsorship form and a slightly embarrassed look I’ve come up with a novel solution where if you donate you get something AMAZING in return, I mean better than my gratitude. So How Do I Bid? SEPTEMBER 7th – SEPTEMBER 10th!!!!!!!!!!!!!!!!!!!!!!!!!!!!!!!!!!!!!!!!!!!!!!!!!!!!!!!!!!!!!!!!!!!! Eating disorders affect 1.6 million people in the UK and 10% of those die due to the effects of the condition making it the deadliest mental disorder. Bulimia is estimated to affect around 1 in 100, and Anorexia 1 in 250. I couldn’t find exact figures for EDNOS (all the others) but its about the same as Anorexia and Bulimia combined. Look at the number of Facebook friends you have. Chances are whether you realise it or not you know someone who has been affected. Beat provide advice and support for suffers, as well as helping them access treatment in their local area. -EDs only affect women – a quarter of sufferers are male. -You can tell if someone has an eating disorder by looking at them – not all suffer dramatic weight loss, some will even gain weight. EDs do not discriminate and affect all ages and ethnic backgrounds. -It’s just for attention – only 1 in 10 seek treatment and although reasons are complex, its highly likely that biological factors come into play. Many sufferers exhibit secretive behaviour and try to hide their condition, and find talking about it difficult. Inspire Suffolk are locally based charity and work to help children and young people reach their potential through providing opportunities in Sport and Education. They have amazing programmes for children and those with additional needs. They coach children in a number of sports including football and handball as well as working with the Princes’ Trust to help get young people back into work. Inspire Suffolk are holding a number of events over the coming year so check out their website if you are in my area! All of the items were obtained by me either directly from the celebrities or from their representatives so I am 100% certain of their authenticity. A 10′ by 8′ of the team GB coxless four gold medal winning boat at the Sydney Olympics. 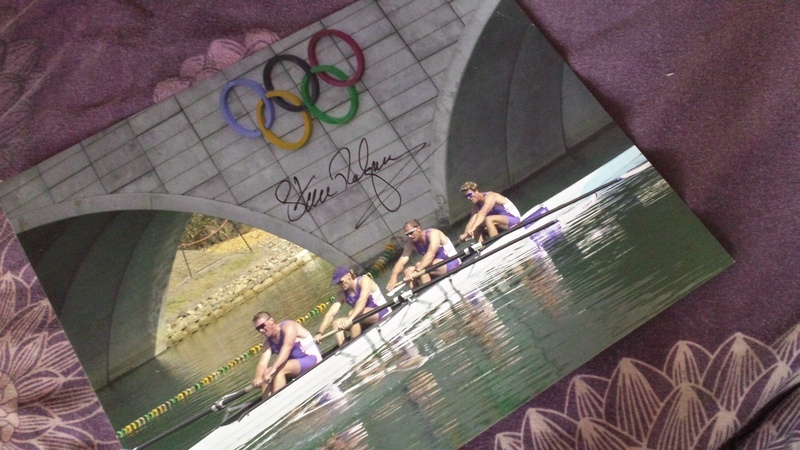 The photo is HAND SIGNED and was obtained directly from Steve Redgrave’s agent. 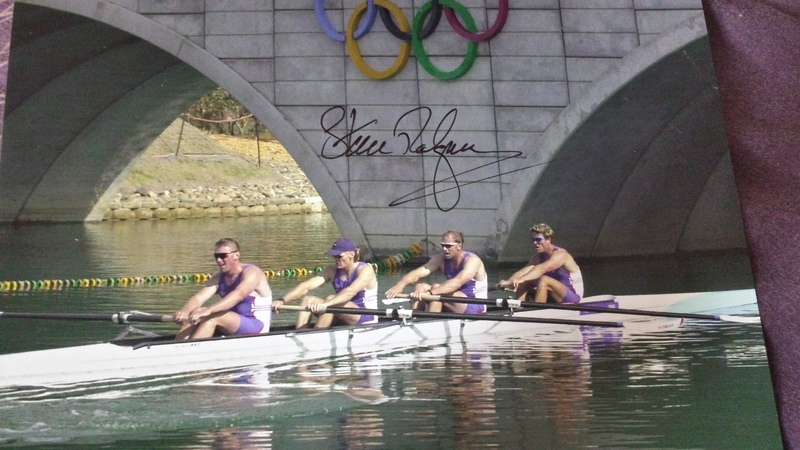 Steve Redgrave is one of the most successful British sportsman ever. He was the first British athlete to have won five Olympic gold medals, a feat surpassed only by Chris Hoy at the 2012 Summer Olympics, and is the third most decorated British Olympian with six medals, after the seven of Hoy and the seven of cyclist Bradley Wiggins. He has carried the British flag at the opening of the Olympic Games on two occasions. In 2011 Redgrave received the BBC Sports Personality of the Year Lifetime Achievement Award. 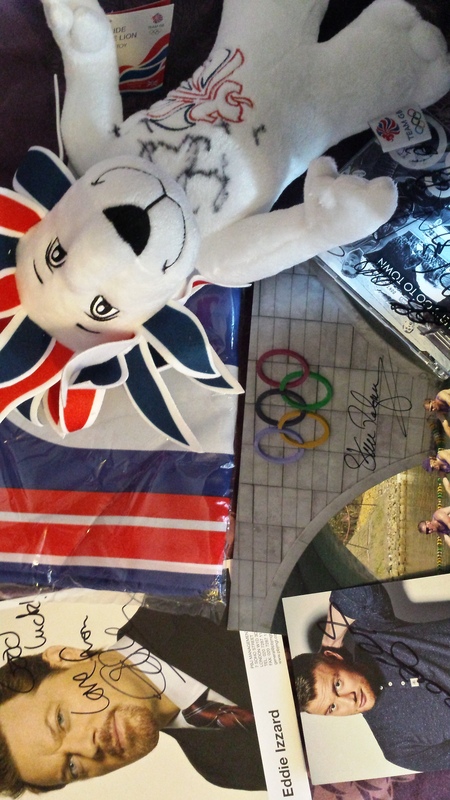 A 12′ Pride the Lion London 2012 Team GB Olympic Mascot signed on the chest by Richard Whitehead in sharpie. This is an amazing ONE OF A KIND ITEM. 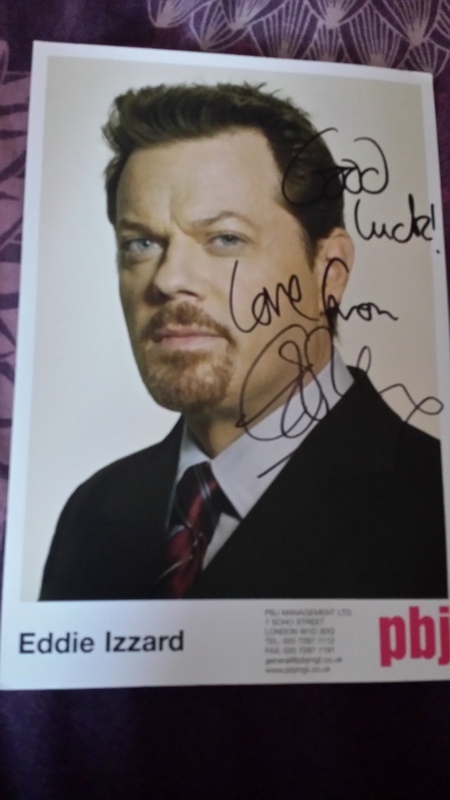 This was received directly from the sports legend himself. Richard Whitehead is one of Great Britain’s greatest Paralympians. He holds the world record for athletes with a double amputation, in both the full and half marathon. Not only is he a successful endurance athlete but is a world-class sprinter. He holds Olympic & European gold medals in the 200 meters and European Bronze in the 100m. Richard is also a former ice sledge hockey player, and competed for the GB team at the 2006 Winter Paralympics in Turin. 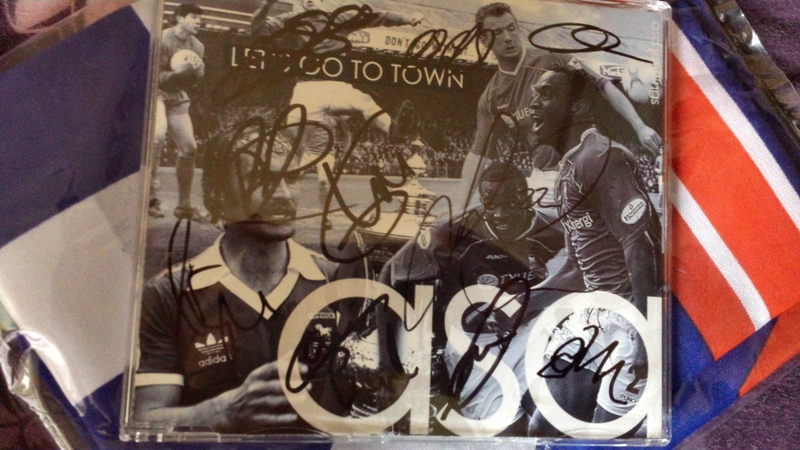 A CD containing the song ‘Lets Go To Town’ as sung by Asa Jennings Ipswich Town Players – Fabian Wilnis, Kevin Beatie Jason Dozzell, Pim Balkenstein & ITFC fans. 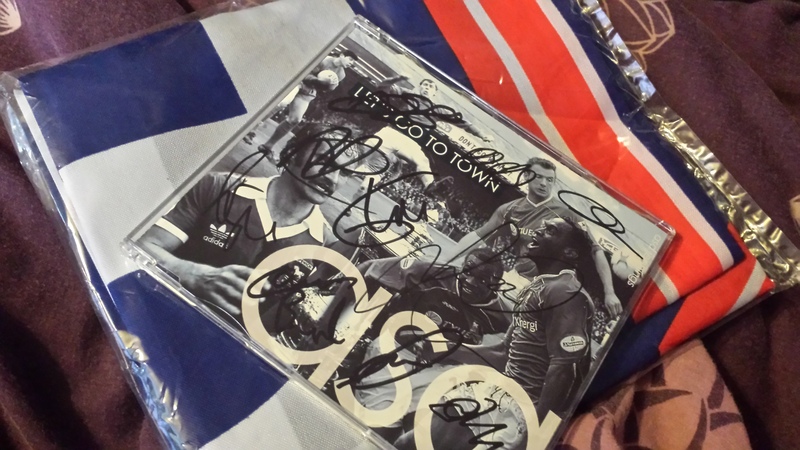 The CD is signed by 10 members of the 2012-2013 squad. 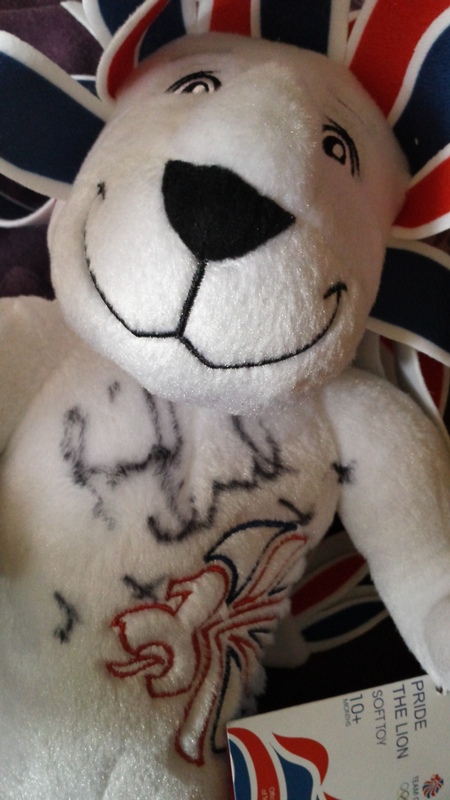 The signatures I can definitely identify are Josh Carson, Cormac Burke and Carlos Edwards. I will let you try to guess the rest! I got this from Inspire Suffolk, formerly the Ipswich Town Charitable Trust, who had these signed at the Football ground. To go with this CD there is also a LARGE Ipswich Town Banner/flag which is perfect to take to games or to decorate a wall. 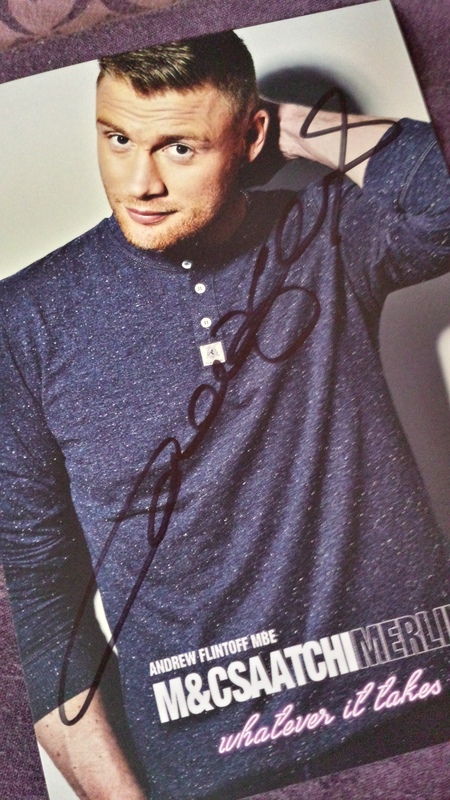 This a 8.5′ by 5.5′ hand signed picture obtained directly from the funny man himself. 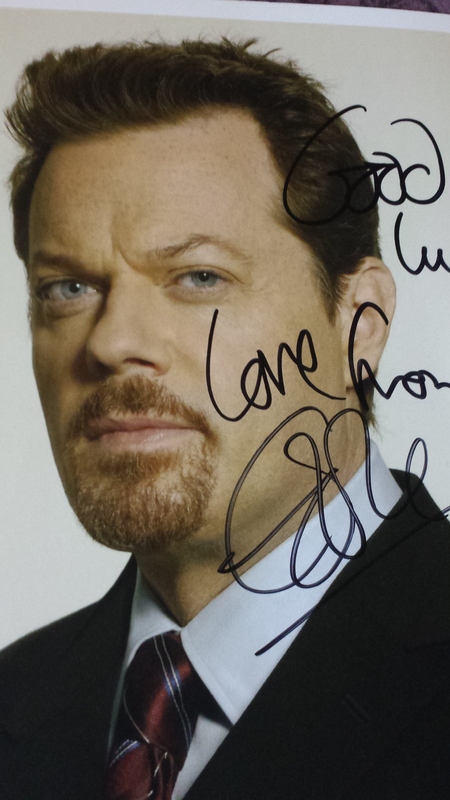 Eddie Izzard may not strictly speaking come under the sporting celebrity category. However this comedian DID complete 43 marathons in 51 days with only 5 WEEKS training and no history of running. So I think that makes him a legend. Those of us who run have some idea how hard one is (and we trained for months) getting up and doing one a day is INSANE. If you are not impressed by that then he is not only funny in English, but performs his act in several languages including, French and German. 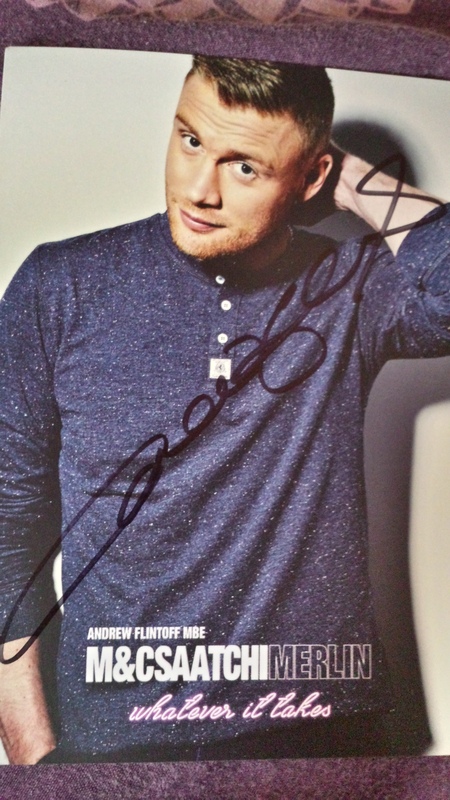 A hand signed 6′ by 4′ picture of Freddie obtained directly from his agent. A fast bowler, batsman and slip fielder, Flintoff was consistently rated by the ICC as being among the top international allrounders in both ODI and Test cricket. Following his debut in 1998, he became an integral player for England, serving as both captain and vice-captain of the team. On his retirement from Test Cricket he took up boxing winning fights against professionals. However not one sit back and relax on his now celebrity status he still plays T20 cricket for Lancashire, and still achieving great things with a bat and ball. He’s also holds 12 world records, including drinking a hot chocolate in the fastest time, kissing the most people in 30 seconds eating the most peas with a cocktail stick in 30 seconds, set the fastest time to high-five 20 people blindfolded, won the most “likes” on Facebook and most people using party poppers. He did the fastest three-point turn in 14.01 seconds and got a new record for the most number of cricket deliveries faced, with 19 balls in one minute. Pretty impressive! So happy bidding, and remember not only is it for a good cause, but bear in mind I’m running 13.1 miles as well. This entry was posted in charity, running and tagged Andrew Flintoff, auction, autograph, Beat, celebrity, Charity, donate, eating disorder, Eddie Izzard, education, Freddie Flintoff, fund raising, GNR, Great North Run, half marathon, Inspire Suffolk, Ipswich Town Football Club, ITFC, justgiving, marathon, Richard Whitehead, runners, running, signed, sport, Sports, Steve Redgrave, swag, Twitter. Bookmark the permalink.